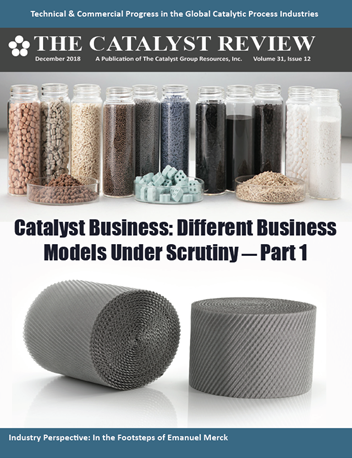 Now in its 32nd year, The Catalyst Review provides the timely delivery of key global information critical to business strategy development in the catalytic process industry. Subscribers help shape our “Special Feature” content via topic suggestions and voting. Subscribers nominate deserving prospects to feature in our “Movers & Shakers” column. Thematic coverage of commercial and process news for more efficient and effective intelligence monitoring. New commentary by industry experts on what that coverage means and how it will influence scientific, R&D, and commercial catalysis. Site subscriber’s Webinars that drill deeper into select “Special Feature” articles, featuring the author themselves. Special new coverage on the work being carried out at Centers of Catalyst Excellence across global locations. Special coverage on “Technology in Action” focusing on new ways catalysis affects processes, products and industry. All of this new content comes along with what has always distinguished The Catalyst Review from its peers: uniquely topical Special Features, poignant Industry Rumors, insightful Media Reviews, thorough Conference Reviews, and unparalleled Experimental abstracts. Join your peers, as nearly 100% of the major global catalyst producers subscribe to The Catalyst Review, including companies like: Dow Chemical, Johnson Matthey, Petrobras, Saint Gobain/NorPro, BASF, Haldor Topsoe, WR Grace, Sasol, Reliance, Evonik, Clariant, Shell, and many others. Begin Your 2019 Subscription Today!